Jen Rock (19 points) faces pressure from Alyssa Leahy and Haley Johnson. 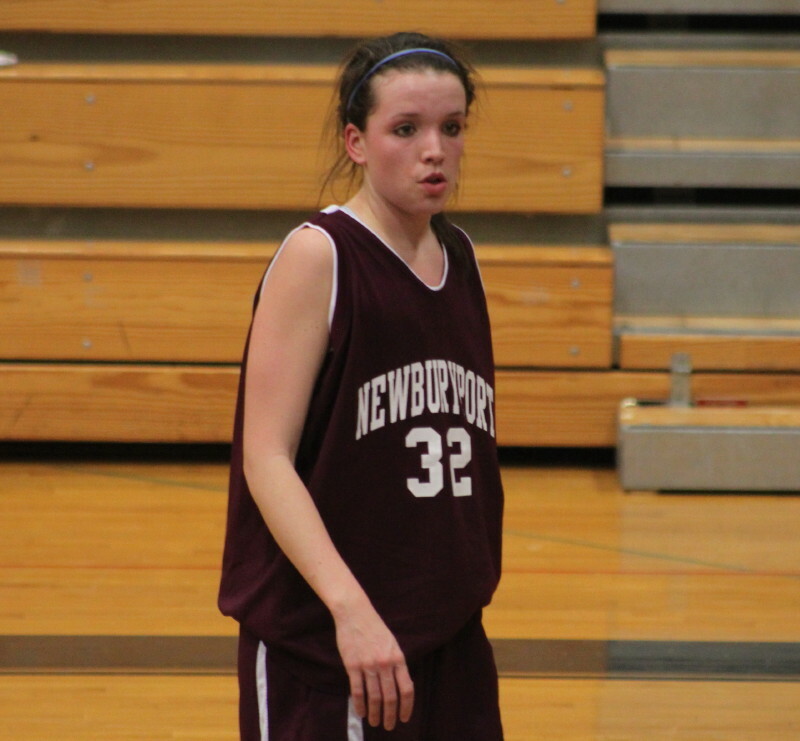 Molly Rowe (11 points) was part of the fine free throw performance (24/29) turned in by Newburyport. (Byfield) Newburyport’s excellent free throw shooting (24/29 – 83%) wasn’t enough to offset poor shooting from the floor (16/57 – 28%) and they fell to Triton, 63-57, in the first round of the River Rival Tip-Off Classic on Thursday night. Triton (1-0) faces Pentucket (1-0) on Saturday night for the championship while Newburyport (0-1) takes on Amesbury (0-1) in the consolation game. The Vikings Jen Rock was the key to their win. 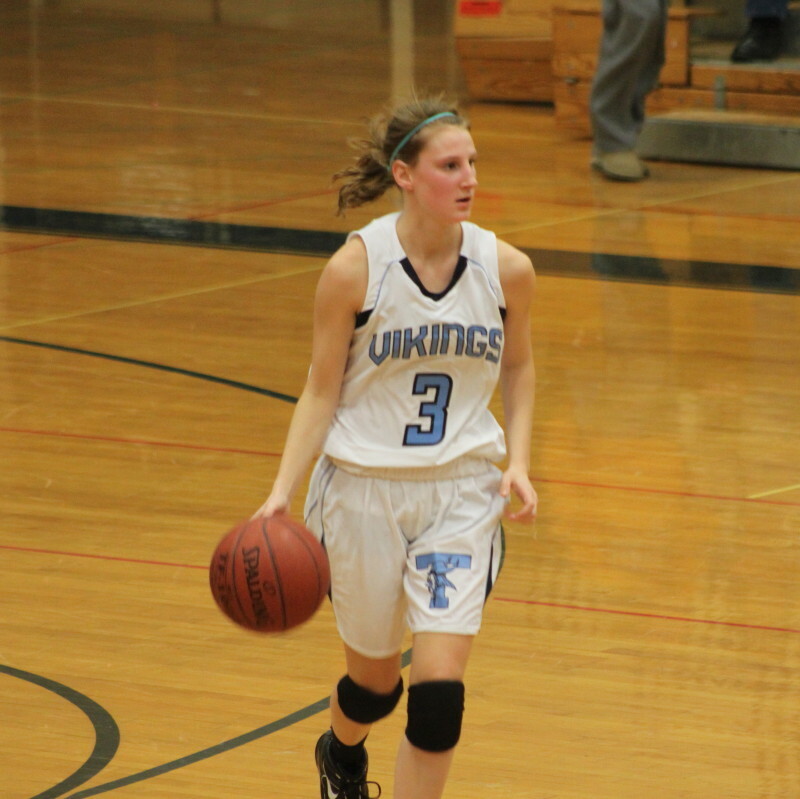 The talented senior put up nineteen points and did most of the ball handling for Triton in the second half. 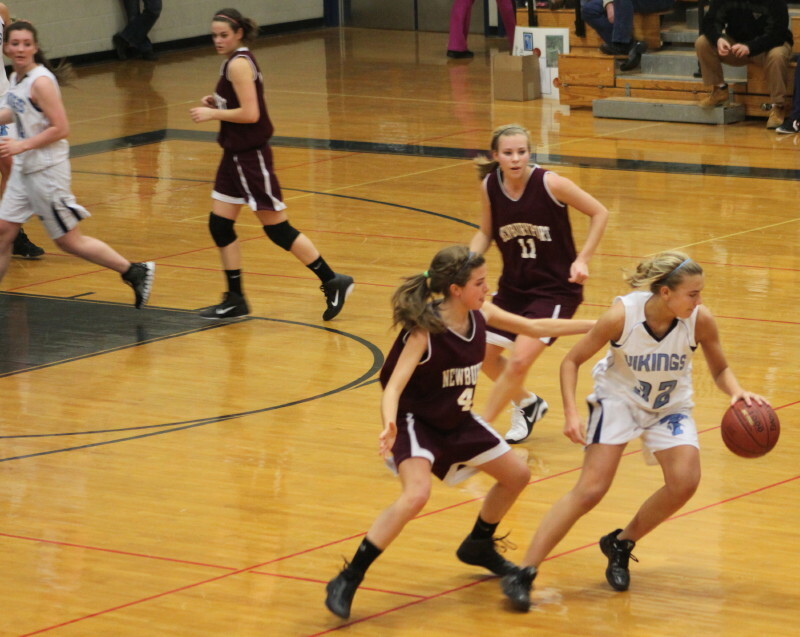 Even when Newburyport double-teamed her she stayed away from turnovers. The Clippers got off to an early 9-6 lead after 3 ½ minutes but two minutes later a layup by Alyssa Conley (23 points) gave Triton the lead (12-10) for good. A ten-point run in the second quarter, fueled by points from Jessica Canning, Jen Rock, Vanessa Eisen, and Laura Mills gave Triton, what turned out to be, its biggest lead (29-15) of the game. The Clippers undertook the road back in the third quarter. A jumper by Sam Leahy (14 points) at the end of that quarter and a rebound putback by Beth Castantini (18 points) to start the 4th sent this one into the “anyone’s game” category at 43-41. 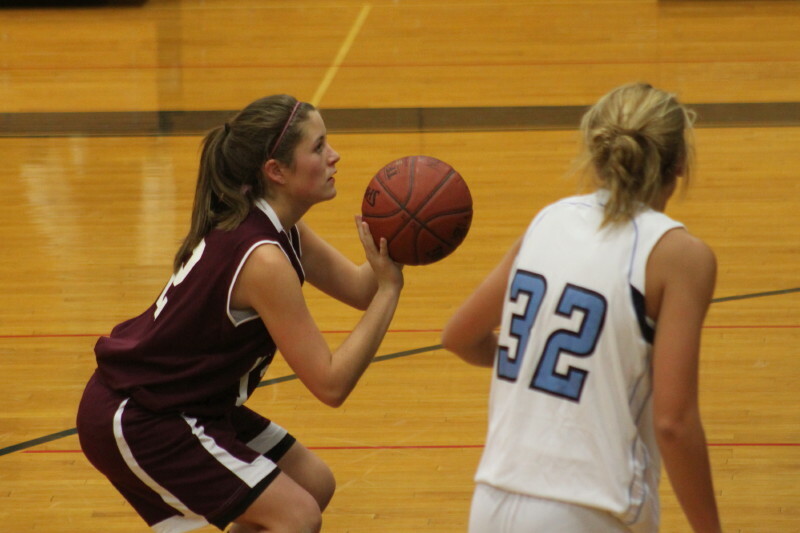 The teams traded baskets before Newburyport missed two opportunities to tie. Triton followed with seven points (Alyssa Conley 3 plus 2 free throws along with a Jessica Canning jumper) in less than a minute to build up a 9-point margin (52-43) with 5 ½ to go. 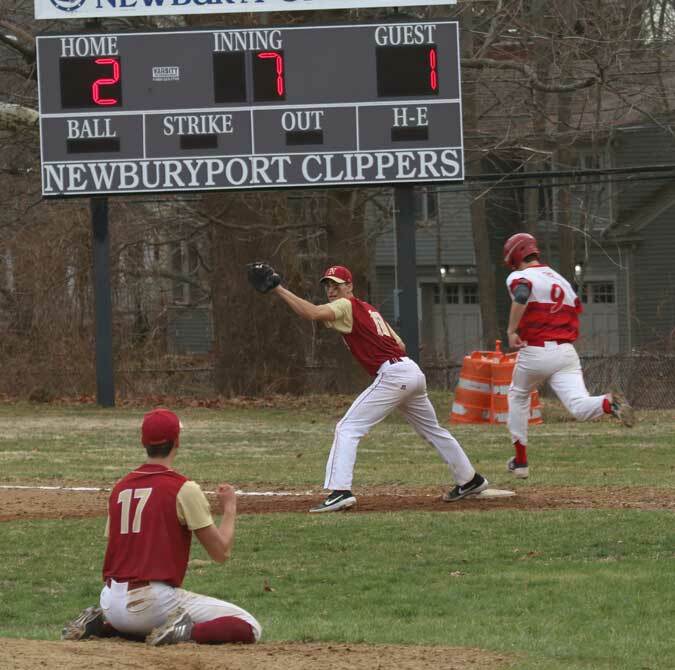 Triton followed with a stretch (3 ½ minutes) of 1-for-6 free thrown shooting including two misses on the front end of 1-and-1’s but on this night Newburyport had little to show for outside attempts. The rest of the way they could never get into the position of having the ball and a chance to tie. Beth Castantini had an adventure of a game. I had her for 2-for-23 from the field. She didn’t make an outside shot until early in the final quarter. However, she had the good sense to take the ball to the basket and draw fouls. At the line she was a remarkable 14-for-16 including nine straight at end as the game tightened. 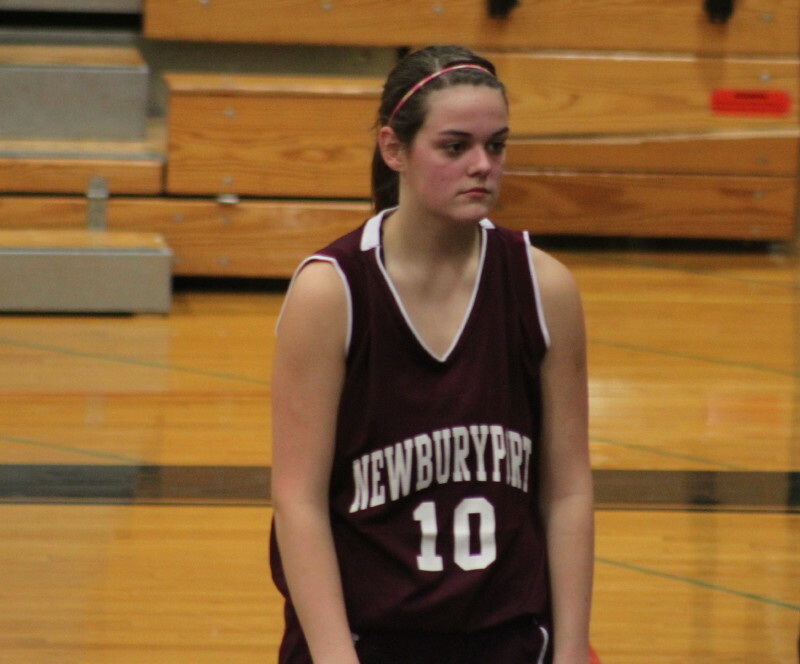 Junior Molly Rowe (11 points) did most of the ball handling for Newburyport. She hit the only three that the Clippers made all night. Gregg Dollas made his debut as Clipper coach. 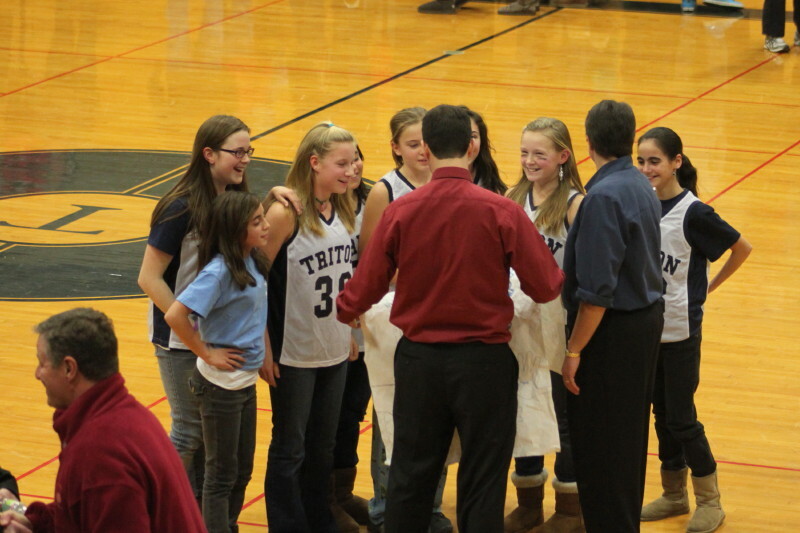 His continued ties to Triton were evident afterwards as students presented him with a banner. Players from the 2009-10 Pentucket state final team. Watching the Pentucket/Amesbury game were three key parts of the 2009-10 Sachem state final team. A check of the program reveals that opponents this season will have more McNamara’s, Viselli’s, and Lane’s to contend with. After being in the Georgetown gym last night what a treat to be at Triton – great lighting and plenty of good seats. Nice place to hold a doubleheader.